[Webmaster’s Note: The version of this letter that appeared on the abbey’s web site from April of 2011 until the summer of 2012 did not include a date or abbey letterhead. 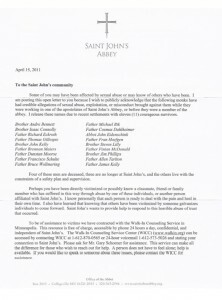 The letter (see links, at bottom) also failed to name the other monks and other Saint John’s personnel against whom credible allegations of misconduct [ View ] had been made and/or settled. I have written to you on the issue of sexual abuse on three previous occasions. Some of you may have been affected by sexual abuse or may know of others who have been. I am posting this open letter to you because I wish to publicly acknowledge that the following monks have had credible allegations of sexual abuse, exploitation, or misconduct brought against them while they were working in one of the apostolates of Saint John’s Abbey, or before they were a member of the abbey. I release these names due to recent settlements with eleven ( 11) courageous survivors. Four of these men are deceased, three are no longer at Saint John’s, and the others live with the constraints of a safety plan and supervision. Perhaps you have been directly victimized or possibly know a classmate, friend or family member who has suffered in this way through abuse by one of these individuals, or another person affiliated with Saint John’s. I know personally that each person is ready to deal with the pain and heal in their own time. I also have learned that knowing that others have been victimized by someone galvanizes individuals to come forward. Saint John’s wants to provide help to respond to this horrible abuse of trust that occurred. To be of assistance to victims we have contracted with the Walk-In Counseling Service in Minneapolis. This resource is free of charge, accessible by phone 24 hours a day, confidential, and independent of Saint John’s. The Walk-In Counseling Service Center (WICC) (www.walkin.org) can be accessed by contacting WICC af 1-612-870-0565 or 24-hour voicemail 1-612-573-5026 and stating your connection to Saint John’s. Please ask for Mr. Gary Schoener for assistance. This service can make all the difference for those who wish to reach out for help. A person does not have to feel alone; help is available. If you would like to speak to someone about these issues, please contact the WICC for assistance. Young people are safest when abuse is reported to civil authorities. That only happens, however, when people like you step forward. It may be hard for you to even consider calling the police about a teacher or cleric you once loved or trusted. But we firmly believe that it is your duty to do this, so that the cycle of abuse can be broken, Finally, going to law enforcement is also important so that there is a public record of what has a occurred.